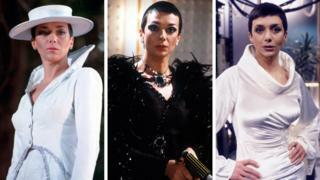 Tributes have been paid to Jacqueline Pearce, who played Supreme Commander Servalan in TV sci-fi drama Blake's 7, following her death at the age of 74. She was also known to Doctor Who fans for her role in 1985's The Two Doctors. Writer Russell T Davies described her as "a truly fine actor" as well as "glorious, vivid, passionate, filthy and the most wonderful company". Pearce worked with Davies in his first TV drama Dark Season, which was shown in 1991 and also starred a young Kate Winslet. Her friend John Ainsworth told the Press Association: "She was outrageous, she was very honest and very straightforward, which didn't always go down very well, but you knew where you were with her.